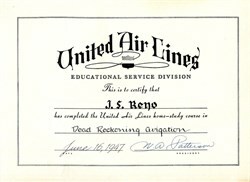 Beautiful certificate from the United Airlines Educational Service Department issued in 1947. This historic document has a border around it with a vignette of the company's logo. This item has been hand signed by the Company's President, William A. "Pat" Patterson, and is over 65 years old. The course was called "Dead Reckoning Avigation". Under Patterson, United invested in new technologies, such as the DC-4 and the DC-8 a pioneering jet, and purchased Capital Airlines in 1961 to become the United States' largest airline ��a title it would hold for nearly 40 years. In 1963, when Patterson became United's CEO and chairman of the board, the airline had more than 30,000 employees. Near the end of his life, he was honored with the creation�� of the William A. Patterson Distinguished Chair in Transportation through the gifts of more than 12,000 individual and corporate donors. At the time of his death in 1980, the Patterson Transportation Lecture series was established.